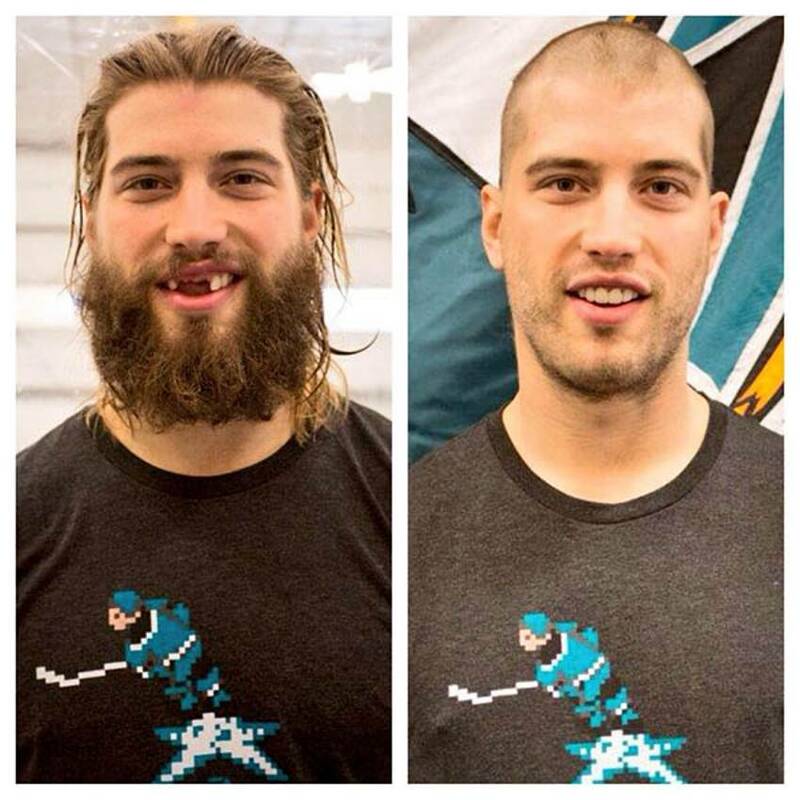 The San Jose Sharks defenseman shaved off his “mountain man” look this week for charity. On the ice, Brent Burns is known for his athletic ability as a San Jose Sharks defenseman. 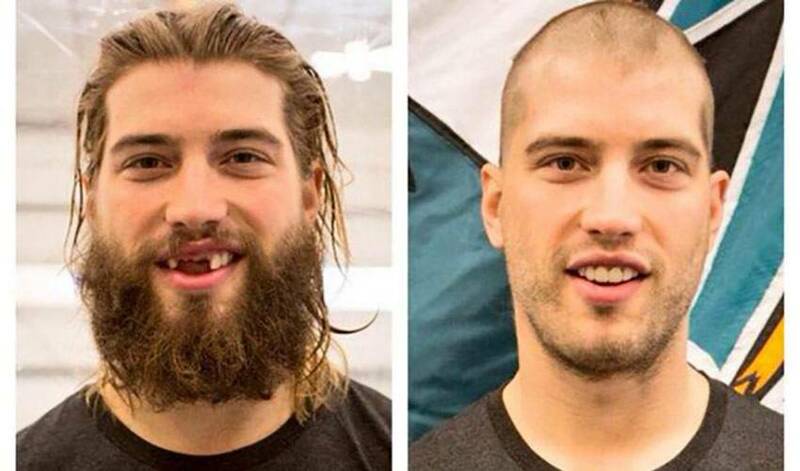 Off the ice, however, Burns is known for his signature long hair and epic beard. If you’re not familiar with it, here is a refresher. A couple of weeks ago, Burns announced he would be ditching his trademark look and opt for a clean shave and a buzz cut in order to raise money for two charities that are close to his heart – Defending the Blue Line (an organization that enables children of military families to stay active and play hockey while their parents are deployed) and the Katie Moore Foundation (honouring the late wife of the New York Rangers’ Dominic Moore and benefits cancer research). 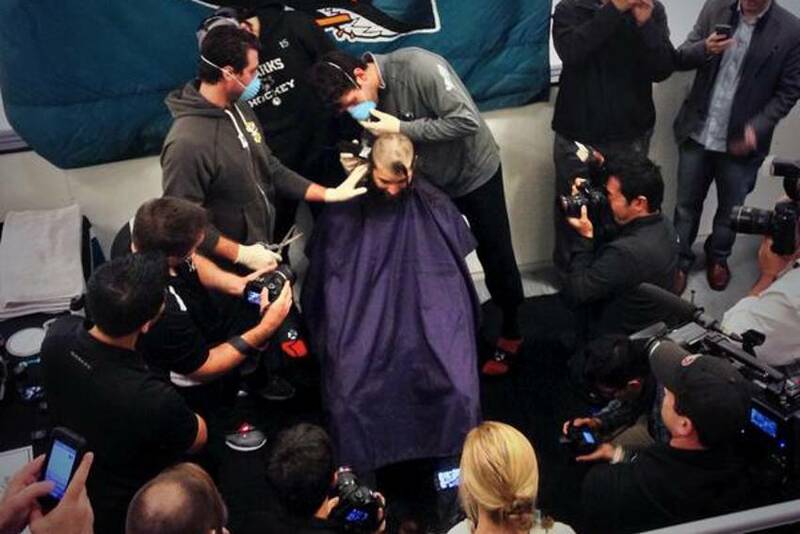 Burns dubbed the event “Burnzie’s Buzz Cut For Charity” and aimed to raise $10,000. By the time the event took place on Friday, November 1st, the funds raised more than doubled that amount, totalling over $23,000. Shane Hudella, of Defending the Blue Line, says that Brent Burns has been a supporter of their cause since it was first created in 2009 and remains their largest annual donor by running a luxury suite for troops at every home game. “Revenues raised from this event will help pay additional hockey fees for our military families in the bay area," says Hudella. "Those grants, along with generous gear donations from the NHLPA Goals & Dreams Fund, allow us to put these special youth through hockey programs at virtually no expense to the service member. My heartfelt thanks goes out to Brent & Susan Burns for helping us keep hockey alive for the children of our nation's heroes!" 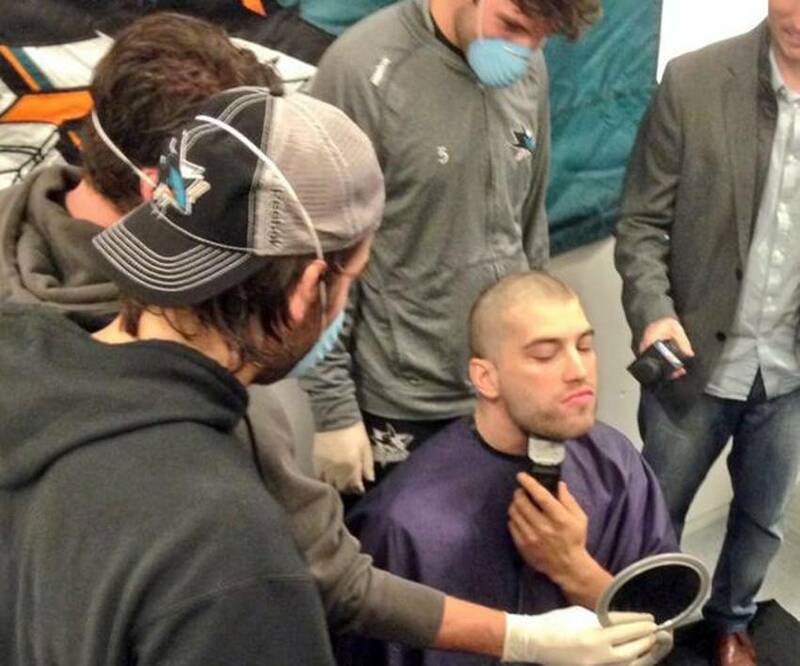 For the shave off, fellow San Jose Sharks players served as barbers. Teammates Jason Demers, James Sheppard, and Adam Burish jokingly donned medical masks and got to work. 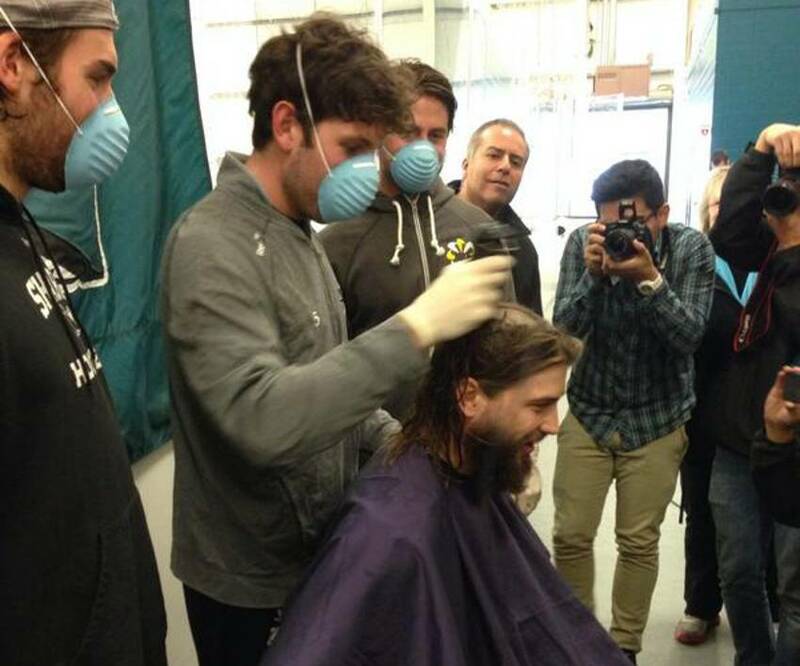 The "barbers" wait for Brent Burns. Burns finishes up the job himself. The end result? 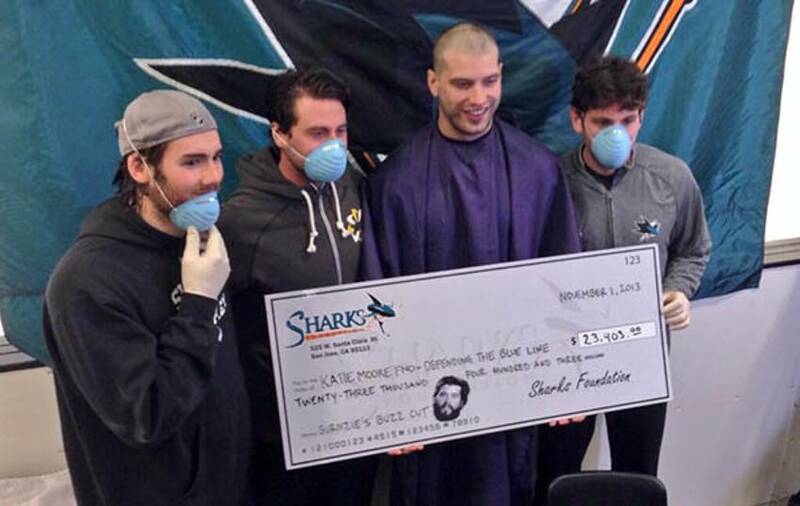 A barely recognizable Brent Burns and an incredible donation made to two worthy causes.